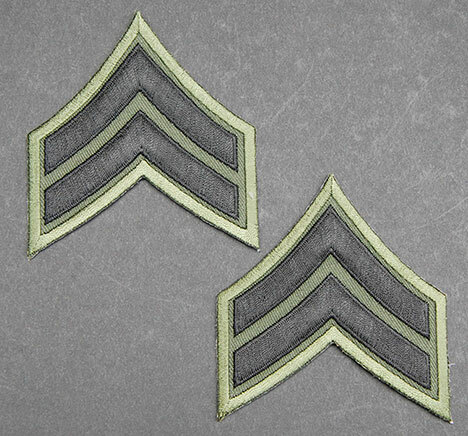 These US GI embroidered reproduction sleeve rank chevrons are perfect for Vietnam reenacting or displays! Subdued US Army insignia for fatigues and combat uniforms was first introduced after a July 1966 order and the two chevron emblem was used to indicate E-4, or Corporal. Subdued metal pin-on collar insignia began to eventually replace embroidered shoulder sleeve rank starting mid-July 1968. However, many troops continued to wear sleeve rank insignia until supplied with the new pin-on devices. These sleeve chevrons are perfect for representing a 1966 through 1969 impression. Subdued black thread on olive drab twill backing with bound edges. Sold in pairs.